As a whole, the information technology industry in higher education seems to be holding steady. Salaries are mostly flat or growing, outlook is positive and people are generally satisfied with their work. All good signs, considering the economic and political upheaval we've seen over the last year. Of course, every IT group has its challenges. So to better understand the nuances of the field, we polled Campus Technology readers working in IT at colleges and universities across the country about their salaries, experience, benefits, complaints, views of the future, etc. Here's what they told us. At public institutions, the average salary across the board was $76,433; the median was $71,000. And at private nonprofits, the average was $79,319 and the median was $77,951. We broke down salaries by title/job level for those positions that had sufficient response in the survey (see figure 2). For C-level titles (chief information officer, chief technology officer, chief security officer, chief digital officer), the average salary at public institutions was $127,166, while the median was $128,500. 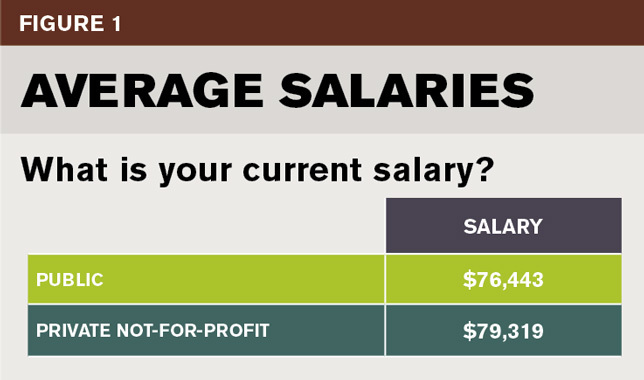 The average at private nonprofit institutions was $122,000; the median $125,000. For IT directors, the average salary at public institutions was $96,332; the median $91,950. And at private nonprofits, the average was $106,000 and the median $100,000. And for IT managers, the average salary at public institutions was $70,041 and the median was $66,000. At private nonprofits, the average was $73,631 and the median $76,500. On the low end of the salary spectrum was help desk/computer support personnel. The average salary for those staffers at public institutions was $59,731; the median $58,000. The average at private nonprofits was $52,475, and the median $48,500. 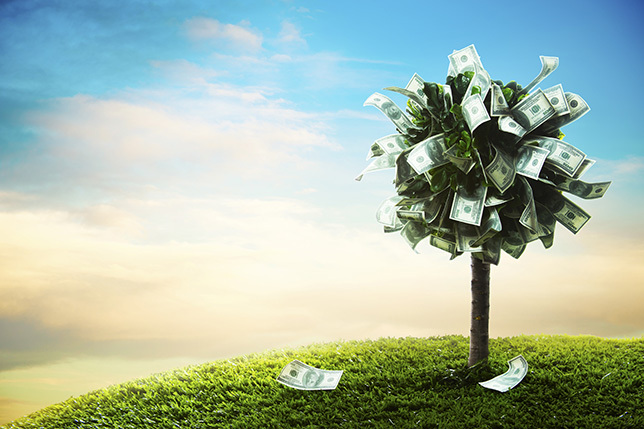 "More money is directed toward research and building expansion than staff development and career growth," noted a systems analyst at a four-year public university in Michigan. "Salary competition with the private sector continues to be a big challenge," agreed an IT director at a four-year public in Georgia. A CIO at a two-year public institution in New York complained of "difficulty recruiting talented staff due to salary compared to the private sector." And a trainer at a four-year public in Illinois warned, "Unwillingness to invest in resources/expertise will lead to an exodus to the private sector." Fifty-eight percent of respondents from public institutions and 67 percent from private nonprofits said they expect to receive a raise within the next year — up from 42 percent and 60 percent in our 2016 survey, respectively. Staffers at public institutions were more optimistic about the possibility of promotion than their private nonprofit counterparts, though the chances were deemed low for both: 19 percent of respondents from public colleges and universities said they anticipate getting a promotion in the next year, compared to 7 percent from private nonprofit schools. A number of comments from respondents complained about the lack of investment in IT. "IT is the bedrock on which universities operate, yet staff are some of the last people to be acknowledged. Ever hear the phrase 'faculty and students'? It gets used all the time. Where is the staff in that? We're invisible until something goes wrong," said a help desk/technical support manager at a four-year public institution in New York. "At the two-year level IT is in trouble. You cannot afford high-quality, experienced personnel due to salaries, enrollments are on a consistent decline, administration thinks they understand the significance of IT but do not act or budget [accordingly], security disasters are looming, cloud tools outpacing the ability to control and protect," opined an LMS administrator at a two-year public institution in Missouri. "While the job market is strong in IT, the jobs no longer pay as well as they used to, and that goes double for higher ed," said a systems analyst at a four-year public in Pennsylvania. "Women feel less welcome in IT now than ever before, and there has been a brain drain as older, highly skilled women have left the field in favor of something with less hassle and more opportunity. The young, male-oriented nature of IT means the most experienced workers are pushed out while they still have valuable insight." The majority of respondents (69 percent in public institutions and 73 percent in private nonprofits) have worked in the IT field for 11 or more years. A hefty number (53 percent in public institutions and 46 percent in private nonprofits) have been at their current institution for over a decade. And that's where they plan to stay: Seventy-eight percent of respondents from public institutions and 79 percent from private nonprofits said they do not expect to leave their jobs in the next year. "Outsourcing adds to the quality problem. Companies send their software jobs to India because it's cheap, but the quality of the software is uneven at best. The pendulum always swings back and forth between in-house IT and outsourcing, but sending this work abroad to be done by cheap labor is often a mistake, especially if there isn't enough oversight by highly trained software architects and analysts. They're not putting things together on an assembly line or following a script on the phone; they're defining how everything works. The commodification of code does not bode well," said the systems analyst at a four-year public institution in Pennsylvania. "Outsourcing help desk or instructional support to provide 24/7 coverage is going to be critical with the growing number of non-traditional students. Expecting current employees to answer questions at all hours is unreasonable," said a trainer at a four-year private institution in the same state. In both public and private institutions, most respondents foresaw healthy growth for IT in higher education. Six percent of respondents from publics went so far as to predict "unbridled growth and opportunity"; and 10 percent of respondents from private nonprofits said the same. Just a handful of people expected to see a slow decline or even doom in the near future. "Budgets continue to be tight, and a shifting of resources to IT cannot continue without real challenges from other sources," noted an institutional research and analytics executive at a four-year public institution in Michigan. "Educational institutions like to stay close to cutting-edge in technology, but many institutions don't have the funds or structure to adopt new technologies as fast as they are developed," said an assistant director for data management and federal reporting at a four-year private nonprofit in Maryland. "It is still a struggle for departments at many institutions to find proper funding/budgets for (and keep up with) the latest equipment and software," agreed a multimedia developer at a four-year private in Colorado. A systems administrator at a four-year private in New York cited "stressed workers as institutions cut into the bone to survive the student population shrinkage. Less custom possible; staff, faculty, then students will suffer." "Underfunded institutions continue to struggle to stay current with technology. Pricing needs to be adjusted to benefit both situations. A wunderkind that attends a smaller institution may never reach his/her full potential, and that would be a loss for the entire field," commented an IT manager at a two-year public in Michigan. "When the guy driving the ship has money on the mind and every turn of the wheel costs one dollar, you're going to hit an iceberg eventually if the ship only goes in one direction. When IT is one of the most expensive departments to maintain, it is usually one of the first to go under," said a technician at a two-year public in North Carolina. Despite those concerns, 74 percent of respondents reported being satisfied or very satisfied with their jobs overall. That satisfaction pervaded through most aspects of employment (benefits, hours, physical comfort, etc.). The areas with the highest levels of satisfaction: hours (79 percent of respondents said they were satisfied or very satisfied), benefits (78 percent), co-workers (77 percent), physical comfort (77 percent) and equipment (75 percent). And the lowest: the departmental budget (32 percent of respondents said they were unsatisfied or very unsatisfied), salary (29 percent), top brass (25 percent), commute (17 percent) and supervisor (16 percent). "Administrators have no idea what we actually do," sighed a trainer at a four-year public institution in Illinois. "Older administrators often do not stay current on trends and innovation," said another trainer at a two-year public in California. "It is a constant struggle to keep the pedagogical unit under the control of IT. Not just at my university but at all of the systems I've worked with in the last few years. In our case, the [center for teaching and learning] continues to try to move our group. The problem with that is the leadership has no technical knowledge. You could learn much by speaking with the folks who want to acquire their technical counterparts — even though they don't have the credentials or the technical knowledge to lead them effectively," said an instructional designer at a four-year public in Maryland. "Faculty governance will continue to allow the long-held belief that training/retraining is unneeded and unnecessary, so quality of online instruction and design of courses will continue to suffer," said a systems administrator at a public institution in Alabama. According to one vice provost of technology at a four-year public in Missouri, "More and more is being demanded by technology, so at some point technology leaders will need to be more engaged at the top-level discussions. The trend appears to be technology leaders reporting to the president, which in all likelihood needs to continue. But emphasis on the academic environment cannot be lost." Finally, our survey included some open-ended questions about what the future has in store for IT in higher education. When asked what will be the biggest data security threat over the next five years, respondents' No. 1 concern was how to protect sensitive data. The top threats they cited: hacking, the human factor (including lack of training), phishing, ransomware, mobile devices, cloud and the Internet of Things. "Higher ed is increasingly a bigger target for hacking and phishing," noted a help desk/technical support specialist at a four-year private nonprofit institution in Kentucky. Survey participants were also asked to identify the biggest shift in education IT over the next five years. Their top responses: growth of online learning, use of mobile devices, moving systems to the cloud, outsourcing and virtual reality. A trainer at a four-year public institution in Ohio, for instance, predicted a "gradual shift to micro-credentials and online courses." And, as a mobile specialist/technologist at a four-year private in the same state noted, "Increase in mobile devices leads to the need for a more robust infrastructure, which is costly, and continuous professional development for faculty and staff. It's a moving target." "Constant forward motion to remain at the 'top of our game,'" said a call center manager at a two-year public in Pennsylvania. "Due for disruption," noted an assistant VP at a two-year public in the same state. "In flux," said a director of information technology at a four-year public in New Jersey. "[IT is] clearly an essential tool in the delivery of instruction, whether in-person or remote," noted an executive vice president of administration at a two-year public institution in Illinois. "IT is close to being ubiquitous," said an online learning specialist at a four-year public in New York. "IT is a learning partner in classrooms and is more than dissemination of information — it is also the creation and the recording of information," commented a hybrid AV-IT manager/integrator at a two-year public in Texas. "IT will be key to the future of most higher education institutions. Students will expect 'Amazon-like' services from their university," said a CIO at a four-year private nonprofit in Iowa. "When does IT just become the standard acceptable and not even thought of as technology?" asked a senior e-learning professional at a four-year public in Illinois. And one IT manager at a four-year private nonprofit institution in North Carolina astutely observed that the value of IT only goes so far when it's poorly communicated: "I work in IT communications and it is severely overlooked in IT. Our department, like most large universities, makes dozens of changes, rollouts and updates to technology every year and we rely on one person to communicate it to the entire enterprise. The 'if you build it, they will come' days are over. IT needs to invest in more sophisticated communication methods to attain mindshare of users." The Campus Technology 2017 IT Salary and Job Satisfaction Survey was conducted in September and October of this year. We put out an open invitation to IT professionals in higher education, advertised on CampusTechnology.com, in our newsletters and in e-mail promotions to our subscriber list. Responses were confidential, and respondents had the option to enter to win a $250 Amazon gift card. After culling ineligible submissions (from faculty members, K-12 staffers, etc. ), we were left with 238 qualified responses. Sixty-eight percent came from public colleges and universities (two-year and four-year); 24 percent from private nonprofit institutions; and 8 percent from private for-profit institutions. Respondents represented a range of institution sizes: 0-499 students: 3 percent; 500-999: 4 percent; 1,000-2,499: 14 percent; 2,500-4,999: 8 percent; 5,000-9,999: 13 percent; 10,000-19,000: 20 percent; 20,000-29,999: 14 percent; 30,000 and higher: 24 percent. They came from 42 states, with the highest numbers from New York, California, Pennsylvania, Texas and Illinois.